The poor urban neighborhoods of Benin’s major city Cotonou suffer from flooding, lack of services, and widespread open defecation. WASHplus is implementing the Urban Hygiene Improvement Program, a three-year hygiene behavior change activity focused on hand washing and household water treatment funded by USAID/Benin as part of its Global Health Initiative, in the most underserved neighborhoods of Cotonou. Local NGO ABMS/PSI is WASHplus’s on-the-ground implementer of its social marketing and hygiene promotion activities, which will use local media, household visits, and school and health center- based programs to raise awareness and foster improved practices. The marketing activities will also focus on the supply of Aquatabs for water treatment. To better understand the current household WASH conditions and what barriers prevent and facilitators promote the adoption of improved hygiene practices in these slum households, WASHplus carried out a baseline survey, the results of which have recently been released and will inform the Ministry of Health’s new urban hygiene and sanitation strategy. WASHplus has combined forces with UNICEF to raise awareness of the conditions in these peri-urban zones and foster increased investment by the government of Benin and donors to improve WASH services and practices. WASHplus has also partnered with Peace Corps/Benin to produce and test a set of technical materials that volunteers will use to carry out small-scale community and school WASH projects. WASHplus opened the eyes of a peri-urban school’s PTA about the poor state of the school’s latrines. When government help was too slow to solve the urgent problem, the PTA came through with funds and action. Read more. Peace Corps Benin WASH Tools and Training Resources, 2014. 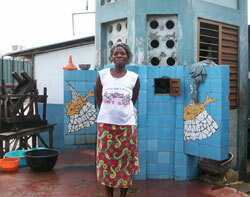 French language training materials on household water treatment, community-led total sanitation and WASH in schools.